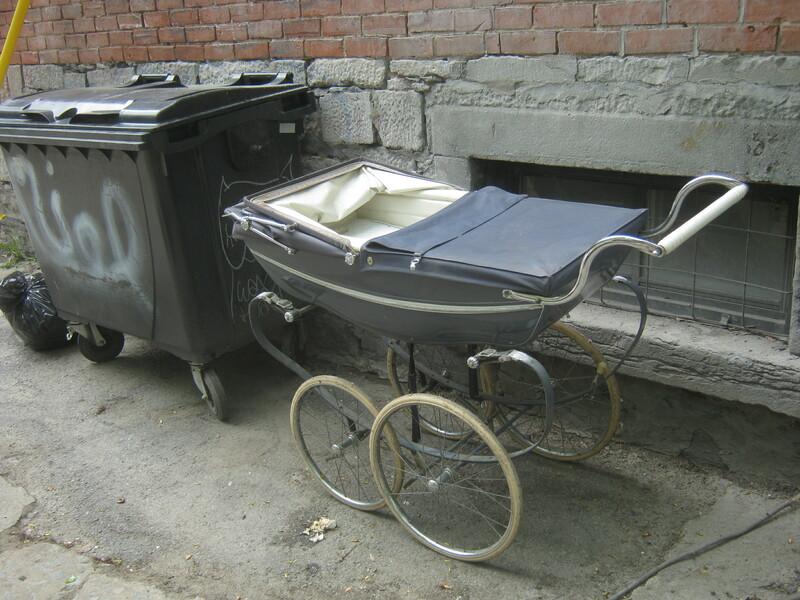 I didn’t find much in NDG and Westmount, but while biking through the McGill Ghetto I noticed this old “Silver Cross” baby carriage (or pram, since it’s made in England) in an alley. 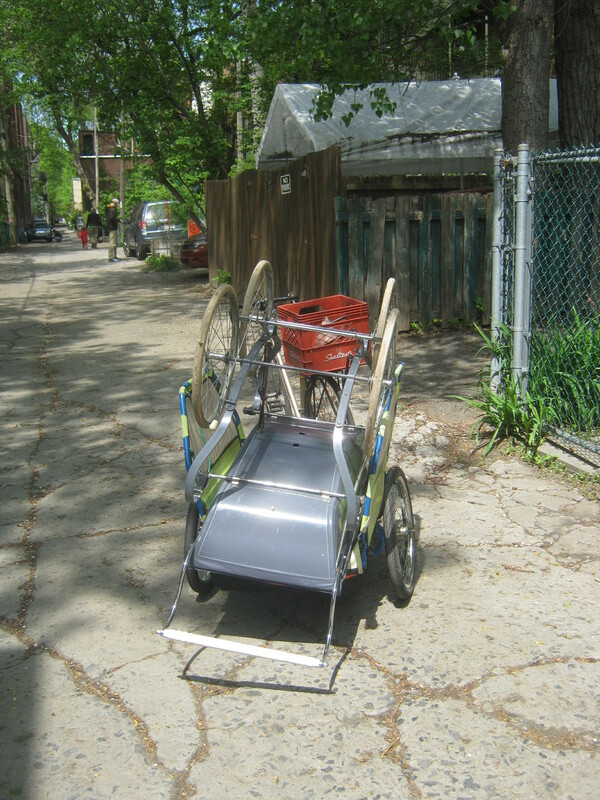 I normally wouldn’t have been able to bring this home, but part of the reason I was in NDG was to meet a reader who offered to lend me his bike trailer. Thanks to John I was able to wheel this thing home. It smells a bit musty (I think it was being stored in a garage) but overall it’s in quite good shape. If anyone wants to buy it let me know. While in NDG I also dropped off the slides from the other day to have them digitized. I found someone on Kijiji who gave me a good price and decided to pay rather than spend many hours (and dollars) figuring out how to do it myself. Hopefully the pictures end up being worth the price. I’m excited to see them regardless. I wish I could buy it. I don’t have room for it, but If I had a baby I would rather have that than a modern stroller. Safety be damned! I guess it’s a good thing I don’t have a baby. How that takes me back, I had a similar German pram for my children…it had a top like that, and then a bigger almost bassinette sized topper, too. Ah, the memories! Looking forward to seeing those pics when they’re done. I can just envision a nanny in uniform pushing that pram. I have to tell you – this is one of the coolest blogs I have ever read. I look forward to it every day. Really admire what you are doing and it is fun to read about. Had one just like this, 40 years ago, for my oldest son. Would love to have this one for my lifesize artist baby dolls, but shipping out here to Sk. would probably cost a fortune. Lol. I’m sure there’ll be a buyer for it there. Wow. I have pram envy. And leeniedevinity is right- they are reaaaally expensive brand new. How lovely, I look forward to see the photos too, please post them if you can! Okay – thanks, I sincerely appreciate it. What did you do with the pram?